I’d always been reluctant to wear a helmet when jumping onto my single speed and riding about town. But one too many crashes, the last of which left me sprawled across a bus lane in Charing Cross Road, persuaded me to compromise my vanity over my safety and wear a lid. What I didn’t expect was that once I started donning my Bern, I’d grow fond of it, and I began to notice the other rather cool products on offer in the ‘urban’ market. I now have a ridiculous collection of bike headware to suit any mood, weather or style. Here are some of the best urban helmets on offer at the moment. Bern Watts helmet. Love this lid! 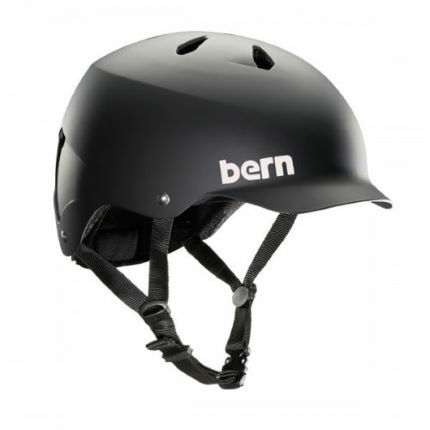 The original Bern helmet was inspired by skate style and developed in 2007. The Watts helmet is a successor of the original Baker model, and to me, it’s iconic. Wiggle stock these at a reasonable £49.49 in matte black, satin white or neon green. Bern Brentwood Zipmold. A similar style to the Watts, but this has a removable flip visor, sunglass channels for fitting your shades and airflow channels to keep you cool. It’s also a bit lighter and a favourite among cycle couriers. We love the bright blue model with orange straps. £69.99 at Evans. Lazer Street Deluxe Helmet Wood. This is such a stylish helmet. Original, cool and comfortable to boot. I like the magnetic thingy on the strap replacing a traditional buckle. £10 off this for an incredibly reasonable £39.99 at the London Bicycle Workshop. Get yourself some wood. The Bobbin Shiny Helmet. If you want to stand out from the crowd this is the one for you, available in gold, bronze or my favourite, chrome. Seen quite a few of these in London town in the past few months, especially down Shoreditch way where the girls down there seem to like donning these when they go to meet their beardy boyfriends for a craft beer. £38.99 from Cyclechic. Really pleased to see that Evans are now stocking these. We met these guys from Torch at the Cycle Show in Birmingham this year and were so impressed with the product we bought one on the spot. This is a bit pricier than some of the others at £85.00, but you get 10 integrated LED lights with different settings that are easily recharged with a USB stick. The design of the helmet itself is great and harks back to the classic Bern. Possibly taking their cue from Lambretta and combining it with Time Trial technology, Kask have developed something very original here. Great shape, some lovely retro features like the leather strap, and a useful and very cool visor. Not cheap at £139.95, and clearly not for any Lycra lovers out there, but, come on, you know this is actually very cool. Designed in Vancouver, Canada, these have a really sleek, understated look. Not dissimilar to a WW1 infantry helmet. But don’t worry, they’re actually very light, and aren’t designed to stop a bullet shot across no-man’s land, although they will protect your bonce if you take a fall at the traffic lights. Love the gloss finish and a choice of colours in beige, cream and blue. £89.00 from Cyclechic. Sawako Crocodile. Those guys and girls at Cyclechic really know their helmets! Don’t worry, it’s not real croc, but ‘croc leatherette’. Maybe not one for a grim Monday morning commute from Croydon when you’re not feeling your best – best keep it for a Sunday potter round the Southbank. The skater dudes there will be impressed. Casqu en Ville helmets. You may struggle to find a UK stockist for these. Being one of those people that likes to check out the local bike shops on my travels, I picked mine up in Paris from Vintage Cycles on 73 Rue de Turbigo. Worth a look if you’re in those parts! Being a French company, these are all about style and design. This ‘Sherlock’ is a must if you happen to find yourself on a vintage bike ride like The Tweed Run and is available at £79.00 from 50 Cycles.com. With winter approaching, keep those ears nice and cosy on wintry mornings with the Karaneige.